Preheat the oven to 350 degrees F. Lightly grease a baking sheet and set aside. In a small bowl, beat together the eggs, milk, and 2 teaspoons of the Essence. In a shallow dish, combine the panko crumbs and 4 teaspoons of Essence. In a third dish, combine the flour and remaining 2 teaspoons of Essence. Spread 1 tablespoon of the cheese mixture into the middle of each jalapeño half. One at a time, dredge in the flour, dip into the egg mixture, then dredge in the panko crumbs, pressing to coat. If necessary, repeat the process. Place the coated peppers, cut side up, on the prepared baking sheet and bake until the filling is runny and the crust is golden, about 30 minutes. 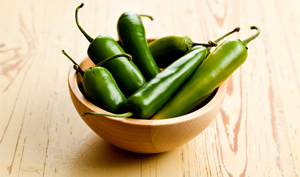 Remove jalapeño poppers from the oven and serve immediately with cold beer.